Maurice Papon - who died on Saturday, aged 96 - became a symbol of French collaboration with the Nazis because of his role in the arrest, internment and deportation of Jews during World War II. It was a description Papon himself could not understand, as he explained to me during conversations over the past three years. I first contacted Papon in early 2004 to inquire if he would be willing to discuss his career - the subject of my doctorate in history at the London School of Economics. He agreed, and I made what would be the first of several trips to his home in Gretz-Armainvilliers, a small town east of Paris. While I was most interested in Papon's career as a civil servant during the Algerian War, it was impossible to avoid his conviction in 1998 for crimes against humanity. To judge by that alone, Papon seemed to have been a willing agent of state-sponsored anti-Semitism during World War II. Yet the evidence pointed towards a more nuanced judgement. Papon appeared not to have been motivated by anti-Semitism, but by a willingness to carry out the state's policies regardless of their consequences. Papon's willingness to obey the state, despite the dreadful human cost, fascinated me. Papon told me that he did not consider resignation to be an option, even after he was instructed to issue warrants for the arrest and internment of Jews in July 1942. During his trial, he said: "To resign would have been easier perhaps but, in the culture that I received from my parents, my philosophy teachers, it meant deserting." Papon was by no means unique in thinking that his duty was to remain in his post, for not a single prefect resigned from the civil service. In fact, the only prefects who left the civil service were those whom the Vichy government removed from their posts. Papon told me that he felt it was his duty to continue serving France during the crisis of wartime. Yet he was unable to explain how he felt it was his duty to participate in the arrest, internment and deportation of 1,560 Jews from July 1942 to June 1944. This nightmare was repeated across France, which deported 76,000 Jews, less than 3% of whom returned after the war. At his trial, the jury found Papon guilty of the illegal arrest of 37 people and the arbitrary internment of 53 others, but acquitted him of acting with the knowledge of the Final Solution. To many the distinction was academic, but to Papon it was essential. It enabled him to argue that he did not know the ultimate fate of the Jews. In the course of our conversations, Papon preferred to remember his other wartime activity: resistance. There was no centralised resistance in France, but rather a series of separate cells that operated independently of one another. Personal recommendations were critical; lives depended on them. In 1943, Roger-Samuel Bloch, a Jewish resister, began a mission to infiltrate the civil service in the south of France. 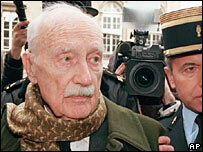 In search of an agent to help him in Bordeaux, he was given the name of Maurice Papon. Mr Bloch made contact, and Papon began his work with the resistance from November 1943 until the liberation of Bordeaux in August 1944. Papon went so far as to shelter Mr Bloch once at his home and twice in the guest rooms of the Prefecture. In the summer of 1944, Papon risked holding a meeting in his office at the Prefecture with the heads of the police and the gendarmes to discuss how they would maintain order at the imminent liberation. Thus on 23 August 1944, when Bordeaux was liberated and resistance leader Charles de Gaulle stepped out on a balcony to greet the enthusiastic population, Papon was with him. 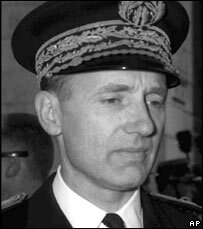 Papon's transition from Vichy collaborator to Gaullist resister was assured, and he rose through the ranks to become France's top civil servant by 1958. Attaining that post must have been a crowning achievement for him, for while history seems certain to remember him as a Nazi collaborator who sent Jews to their deaths, Papon defined himself as a civil servant above all. And that may be the key to understanding his actions. Papon believed a civil servant could not do wrong if he was acting in the service of the state. I asked him what he thought of the revelations in 2001 of General Paul Aussaresses, who admitted to torture and summary executions in the Algerian War. Papon said: "He would have done better to keep silent. There were perhaps some wrongdoings, but he was also at the service of France. He only had to keep quiet."